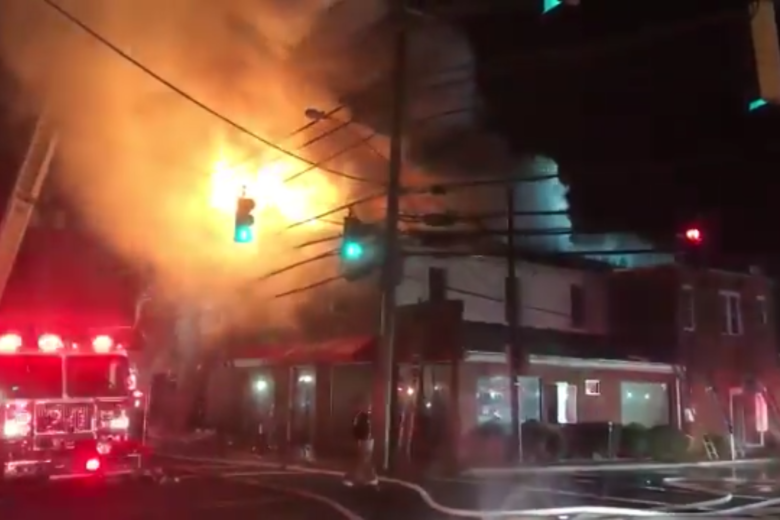 A three-alarm fire tore through a building in downtown Upper Marlboro, Maryland, early Thursday, damaging local businesses and displacing three people. WASHINGTON — A three-alarm fire tore through a building in downtown Upper Marlboro, Maryland, early Thursday, damaging local businesses, displacing people and closing down a major thoroughfare. Main Street between Pratt Street and Water Street will remain closed indefinitely as crews pick up after the early morning blaze. The Prince George’s County Fire Department said approximately 100 firefighters responded to the three-story building at 14707 Main St. The fire broke out around 1:30 a.m. and burned for over an hour. The building houses both local business and apartments, including Al’s Deli, where officials believe the fire began. Photos from the scene show the storefront to have been severely gutted. All three floors were affected by the fire, and three of the building’s occupants have been displaced and will be assisted by the Prince George’s County Office of Emergency Management and the regional American Red Cross. All occupants are safe, tweeted Prince George’s County Fire Department Chief Spokesperson Mark Brady. No injuries were reported. One firefighter was treated on scene for heat exhaustion, but did not require hospitalization, Brady said. Below is a map of the area of the fire.